Humanity's Existence Is Completely Dependent On Earth : 13.7: Cosmos And Culture We owe our existence to little photosynthetic bacteria — but there is much more to this story, as life can only mutate and adapt when the planet offers the right conditions, says Marcelo Gleiser. 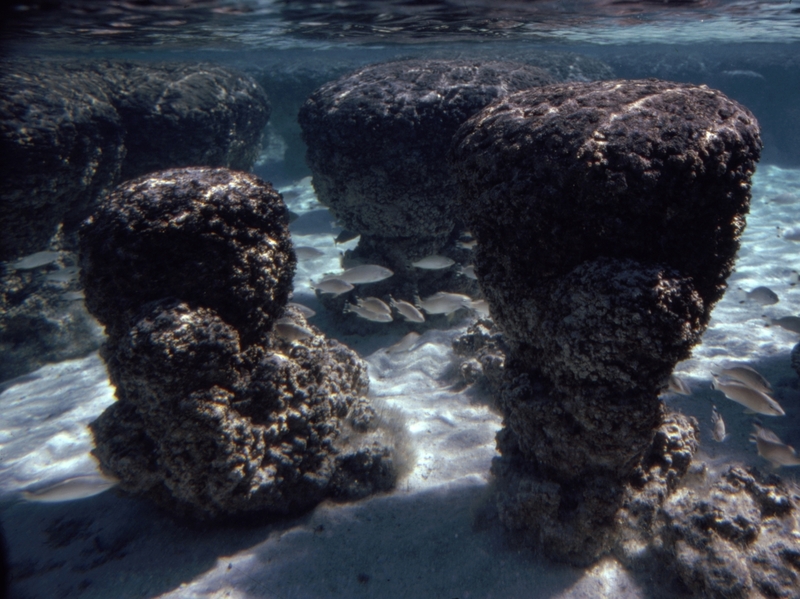 Stromatolites (deposits built by colonies of cyanobacteria), are seen underwater at high tide in Shark Bay, Western Australia. Living in cities or suburbs, amid the race of everyday routine, we have little time to care about what goes on at the planetary level — or about the uniqueness of our planet. But even if every world out there, among the trillions in our galaxy alone, is unique, there is something very special about Earth: Our existence is completely and inextricably dependent on it. This is something we should pause to consider, even amid the race of everyday routine, as the last week's report from the Trump Administration starkly reminds us. First, there is the sun. The energy it generates, and has been generating for almost five billion years, is absolutely essential for life on Earth. Our planet lies in the so-called habitability zone, defined as the range of distances from star to planet where water, if present, has a chance of being in its liquid state. Why the fuss about liquid water? The premise here is that without it there is no life, at least as we know it. Still, we see that Venus and Mars, also in the sun's habitability zone, haven't fared so well. (Note that there are controversial debates about what really comprises a planet's habitability zone, as for example, here. As in a football game, being well-positioned isn't enough for a player to score a touchdown. A player needs talent and speed, what, in a planet, we'd call appropriate properties. Venus is truly like hell, so hot that rocks glow. Its super-dense atmosphere is filled with sulfur compounds, including hydrogen sulfide, the one that gives rotten eggs their disgusting stink. Mars is a frozen desert, with canyons and other rich geological structures that show that things were different in its past. In its infancy, Mars had plenty of water, enough, many believe, to have had some kind of rudimentary life. But its weak gravity couldn't stop its atmosphere from being blown off by solar winds, the radiation the sun blows across the solar system. Earth is approximately 4.53 billion years old. During its first 600 million years, constant bombardment from asteroids and comets, debris from the early formation of the planets in the solar system, brought a host of precious compounds and water — but also created impossible conditions for life to thrive. Still, as things quieted down, the stage was set for the primordial stew to brew the first living creatures, at least 3.5 billion years ago, possibly sooner. These simple, one-celled creatures ruled the day. We see their fossils in ancient bacterial colonies called stromatolites, as the ones found in Australia's Shark Bay. For a billion years, little happened. But Earth cooled and settled, and shallow bits of land poked up from the oceans here and there. Some 2.4 billion years ago, these unicellular beings went through a fundamental mutation that made them capable of photosynthesis, essentially the property of turning sunlight into food by consuming carbon dioxide and eliminating oxygen. Slowly, these creatures promoted a global change in Earth's atmosphere, which became progressively richer in oxygen. Compared to other worlds we know, Earth stands out as an oasis for life. Its atmosphere protects surface dwellers from lethal solar ultraviolet rays. Its magnetic field also acts as a powerful shield against radiation from space, especially particles from the solar wind. The slow drift of tectonic plates recycles carbon dioxide between oceans and atmosphere. Our large moon stabilizes Earth's tilted rotation axis, allowing for the seasons and for water to remain liquid in much of its surface. These properties, taken together, make our planet home for countless life forms, from the cold and dark depths of oceans to frozen mountaintops. We are not here by chance. We are the product of this story, of the mutations that transformed bacteria into people, of the cataclysmic accidents that redefined the conditions on our planet, of the climatic and geologic changes that unfolded over billions of years. Knowing this doesn't make us smaller, as many believe. Quite the contrary, it sends us to the top of this extended chain of life, as we are the only creatures we know capable of reconstructing our past with such detail and, at the same time, of asking questions about our future. On the other hand, we must realize that being at the top doesn't mean we can despise those below. From power comes responsibility, which, in this case, means to work to protect life and our planet, understanding that we are part of the same chain that connects bacteria to whales. If our knowledge makes us strong, we remain fragile when confronting nature's power. If we plan to remain here for a few more thousands of years, the only option we have is to treat Earth with humility and respect.